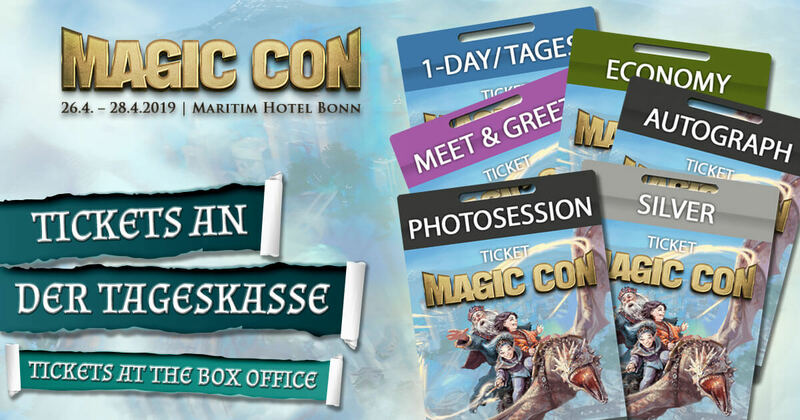 from now on our ticket shop – we have to prepare for the MagicCon 3. All types of tickets (weekend and day passes) as well as autograph and photo session vouchers are still GUARANTEED ON SITE during the event days. The prices for the Day Tickets are as follow: Friday 35 EUR, Saturday 55 EUR and Sunday 45 EUR. For additional price information please click HERE. So, you fanciful contemporaries, come to the fantasy and mystery event of the year, the MagicCon 3 from April 26th 'till 28th 2019 at the Maritim Hotel Bonn! We’ll see us … soon!